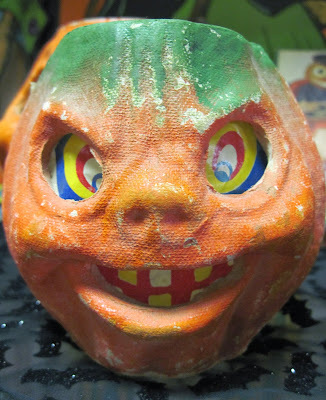 Collecting vintage jack o' lanterns can be very addictive. Though they were mass produced, there were many different styles, and they all have individual character due to their own particular aging and wear. 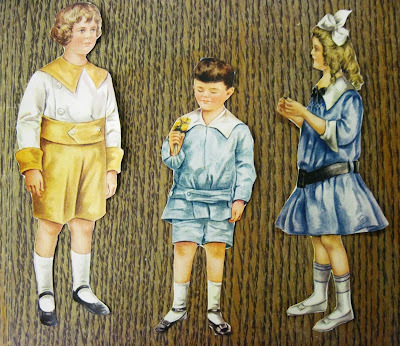 These are American, and date circa the 1940s. 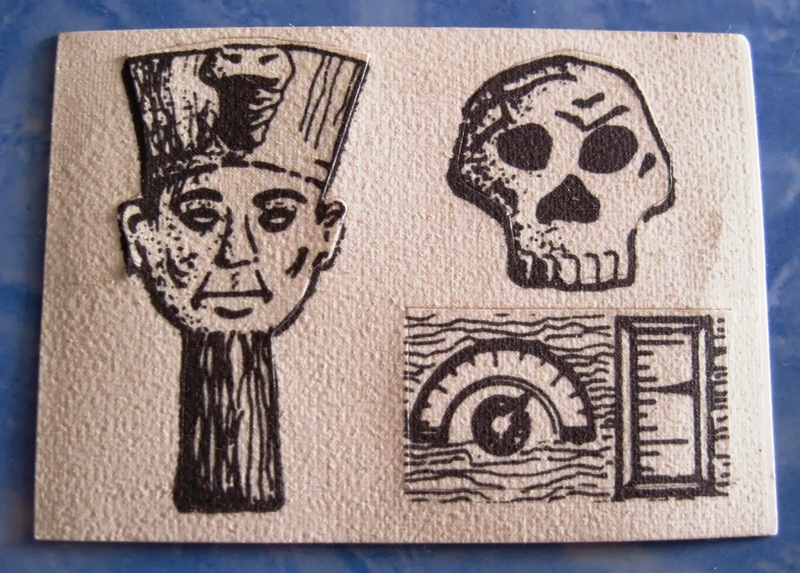 Made of a pulp/composition material, they have paper face inserts, and were meant to be used with real candles inside. Some still have traces of melted wax in their interiors, and it's incredible that they all didn't just go up in flames. 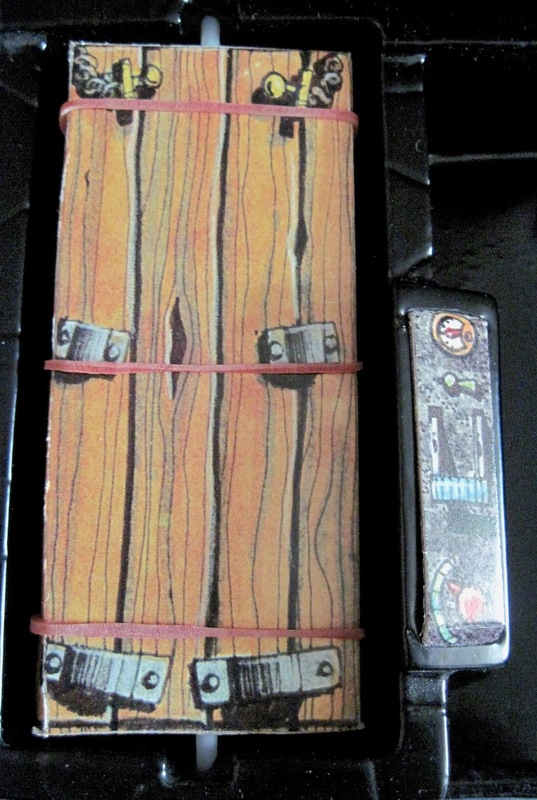 These range in size from about 3.5 inches to 10 inches tall. These two small lanterns were made from the same mold, but have distinctively different appearances due to the paper inserts used and the wear to their exteriors. 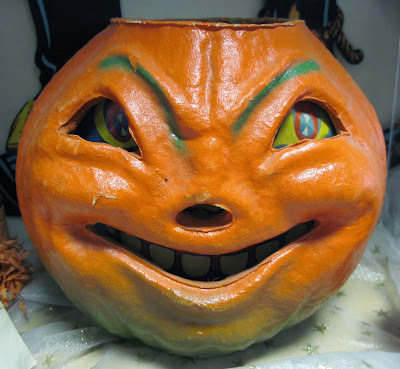 This large jack o' lantern is one of my favorites. It's open nose is unusual, and it has a very expressive face. 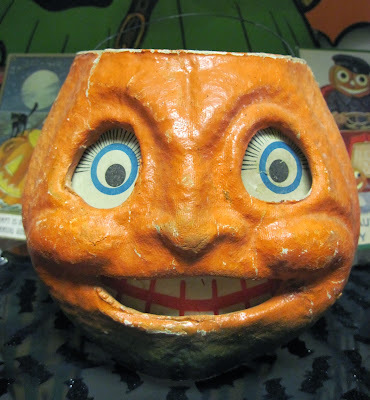 Eyelash adorned, this jack o' lantern's paper insert is from an antique German variety, but it suits this American pumpkin well. 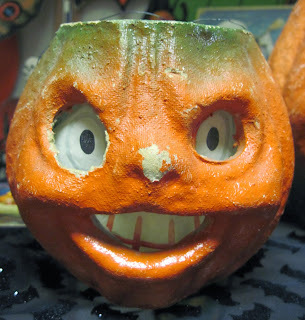 It's common to find these jack o' lanterns missing their paper faces, or with replacements, as the originals did sometimes succumb to the candle flames. 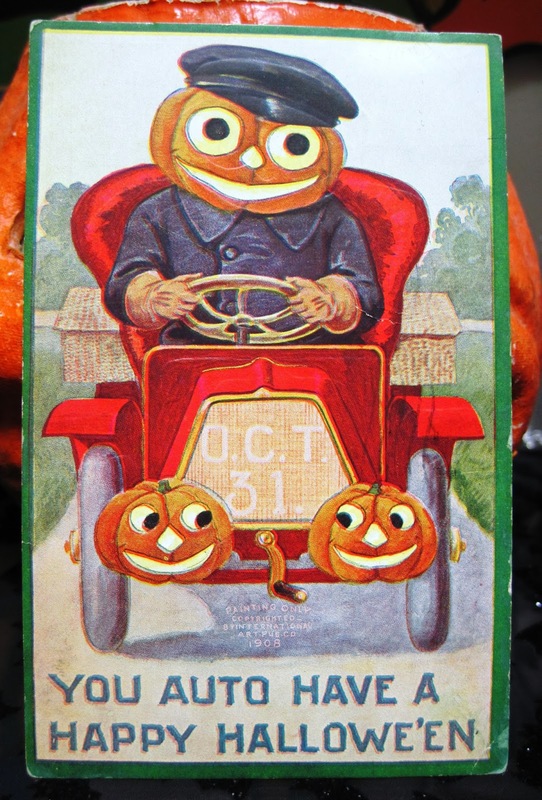 Halloween is fast approaching, and so is the pumpkin headed driver of the automobile on this antique Halloween postcard. 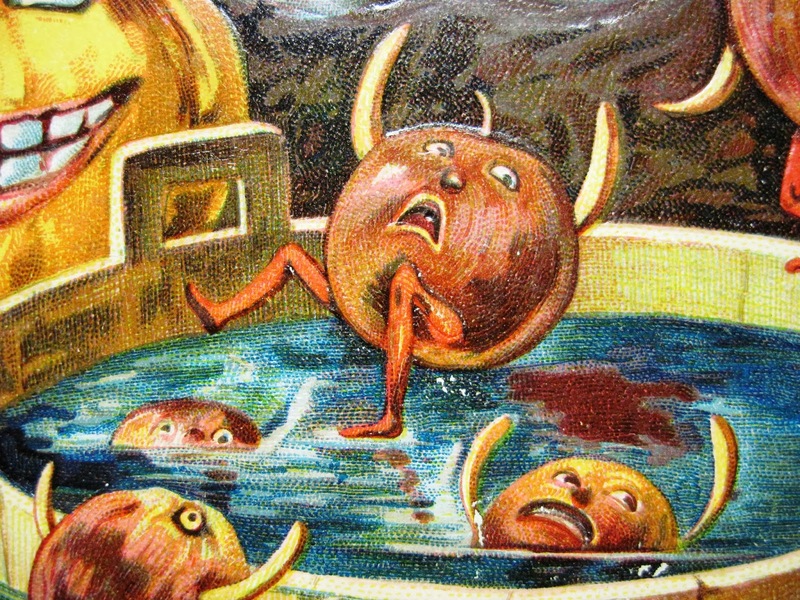 Circa the early 1900s. Note the jack o' lantern headlights, a clever touch. From a 1917 issue of Ladies' Home Journal, a child who was very good with scissors cut these wonderful Halloween paper dolls. 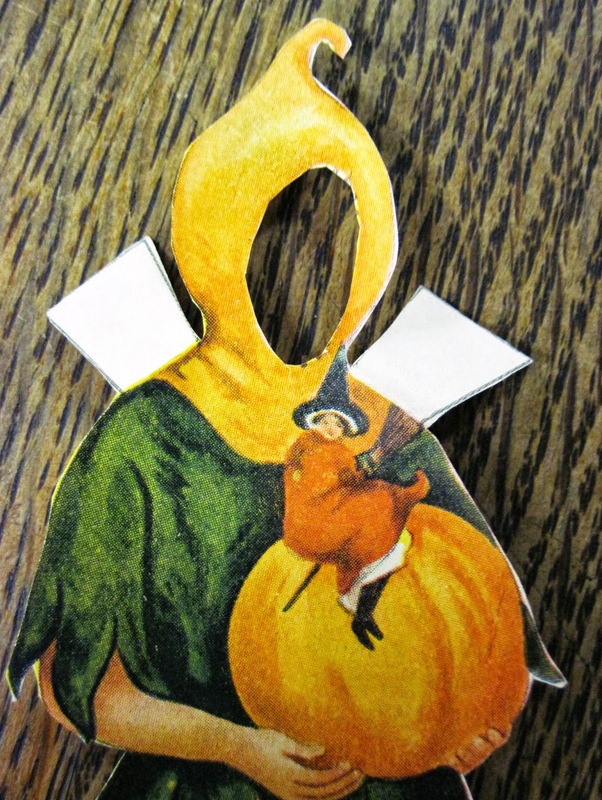 The dolls include three children in period clothing. 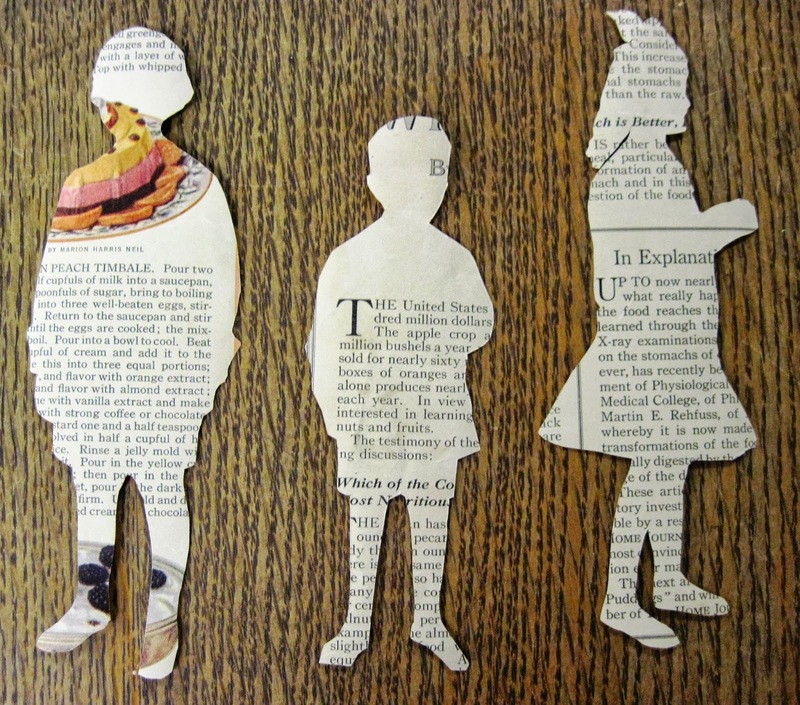 The back side of the dolls reveals their magazine origins, with portions of articles visible. The costumes are beautifully detailed, and include a witch, a clown, and a jester. 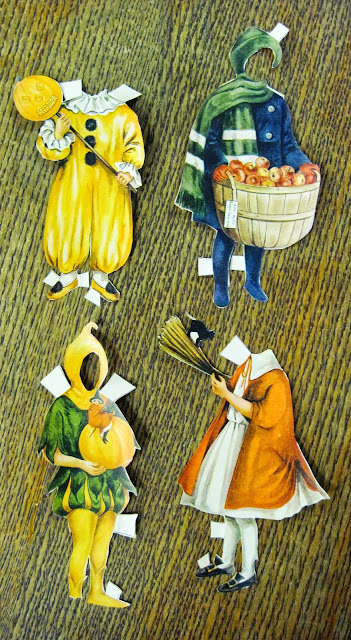 There is also an outfit featuring a bushel of apples for one of the dolls to carry. 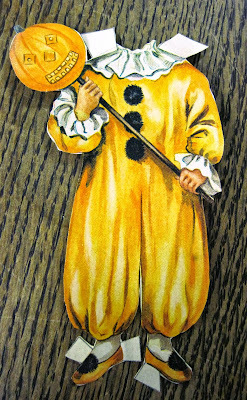 The clown carries a parade lantern. 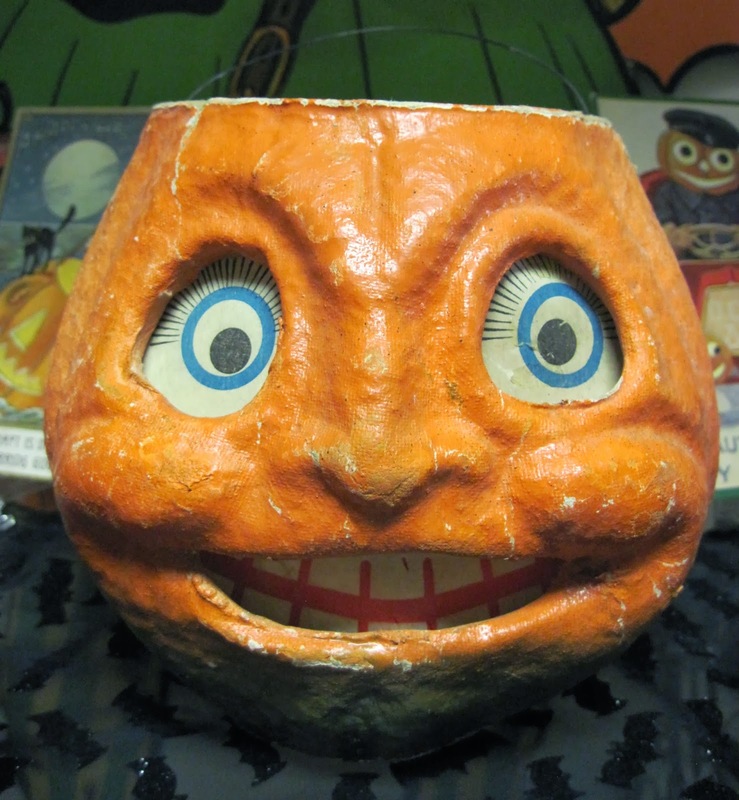 These antique tin jack o' lanterns are now some of the rarest, most valuable, and most highly sought Halloween collectibles. You can see some original patent drawings for these lanterns at http://www.spookshows.com/patents/patents.htm. 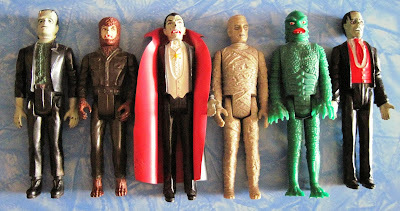 Ah, the classic Universal Studios monsters: Dracula, the Mummy, the Wolfman, Frankenstein's Monster, the Creature from the Black Lagoon, and the Phantom of the Opera. 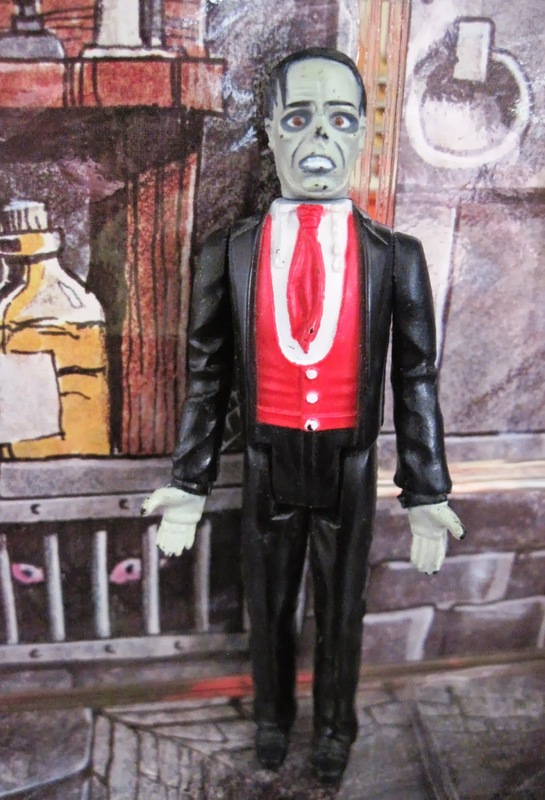 These movie monsters of the 1920s - 1950s saw a resurgence in popularity in the 1960s, when their films became late night television movie fodder, and again in the 1980s when Universal Studios featured them in their theme park merchandising and stepped up their product licensing. 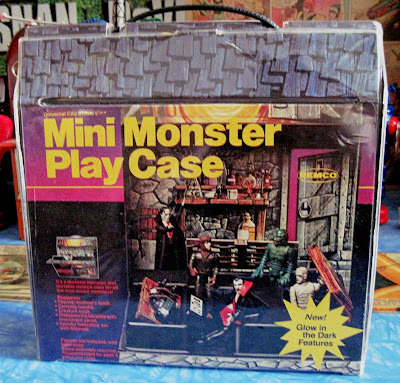 One of the best toy lines to result from these efforts came from Remco, which released their Mini Monsters in 1981. 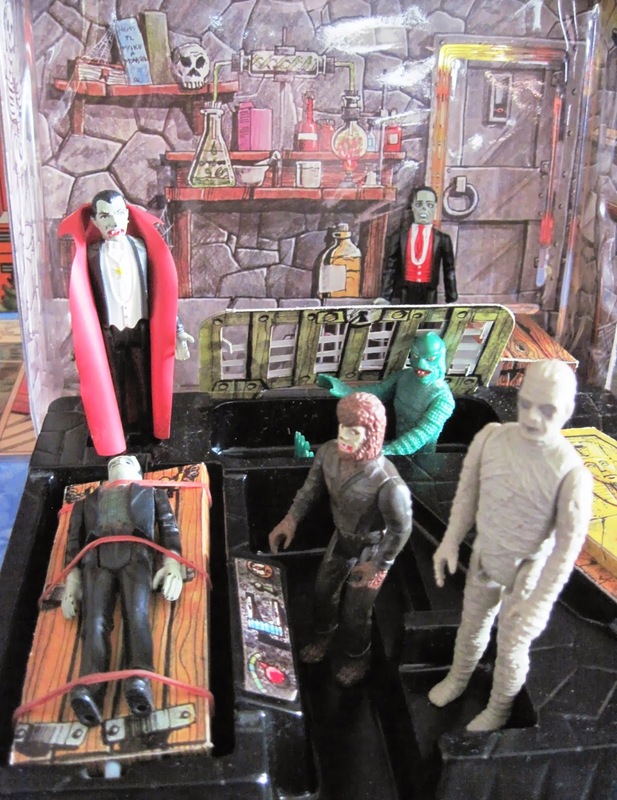 The 3 3/4 inch figures were the same scale as the era's popular Star Wars characters, making cross-over playtime dreams come true: Princess Leia captured by the Creature from the Black Lagoon! Darth Vader and Dracula in a battle royale: who would win? 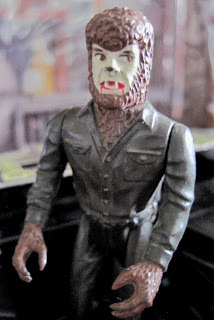 The Wolfman and Chewbacca becoming best friends. 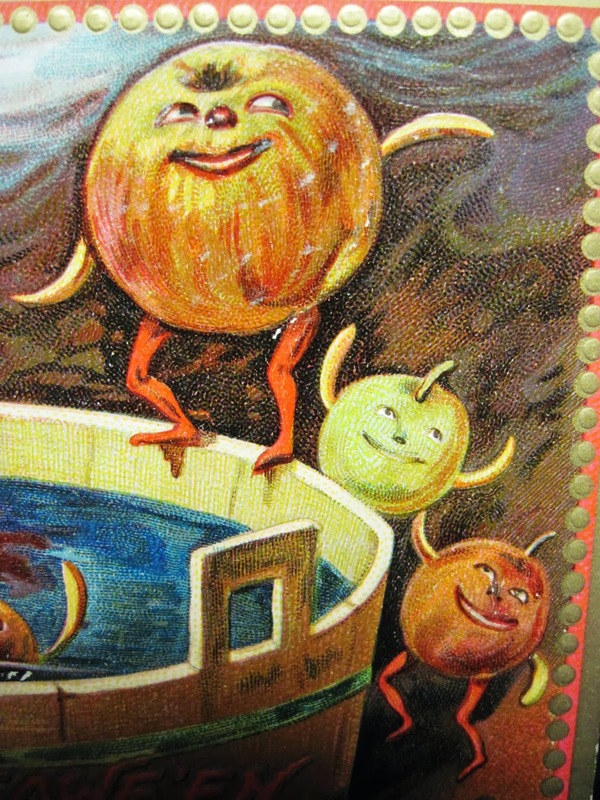 The Phantom playing with the Cantina band on Tatooine. 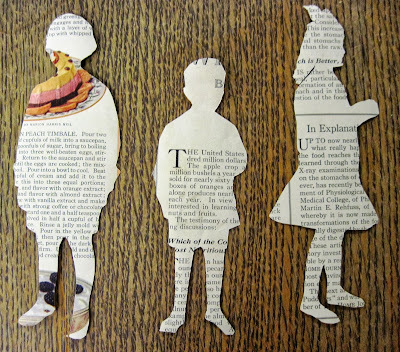 The possibilities were endless. 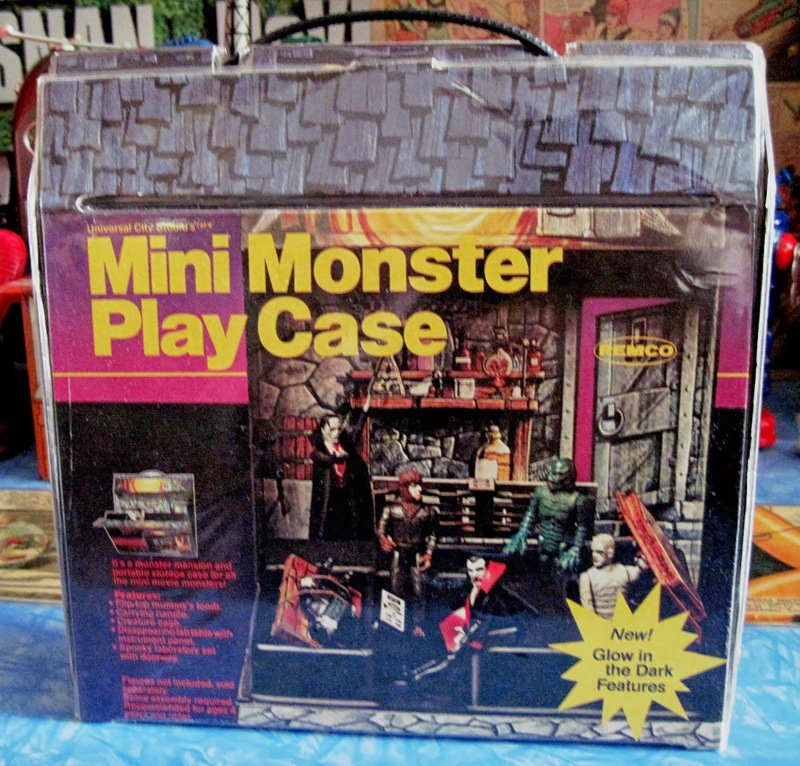 To house the figures, Remco created a play case, made of vinyl covered cardboard like so many playsets from this time period. 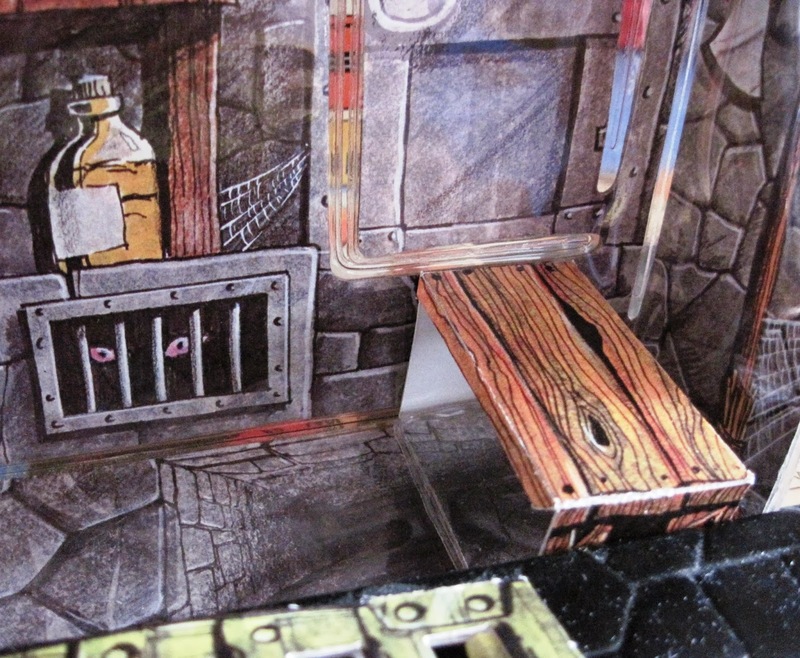 With an interior of vacuum formed, brittle plastic and cardstock paper, it's fragile by today's standards, but nonetheless it's a gorgeously designed toy with tons of imaginative potential. 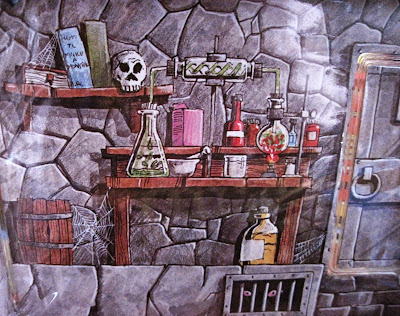 Let's take a tour. 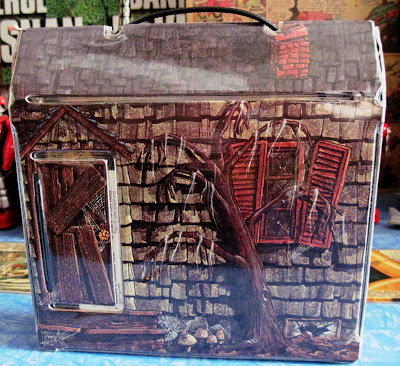 The case is about 10 inches tall, and comes with a carrying handle. 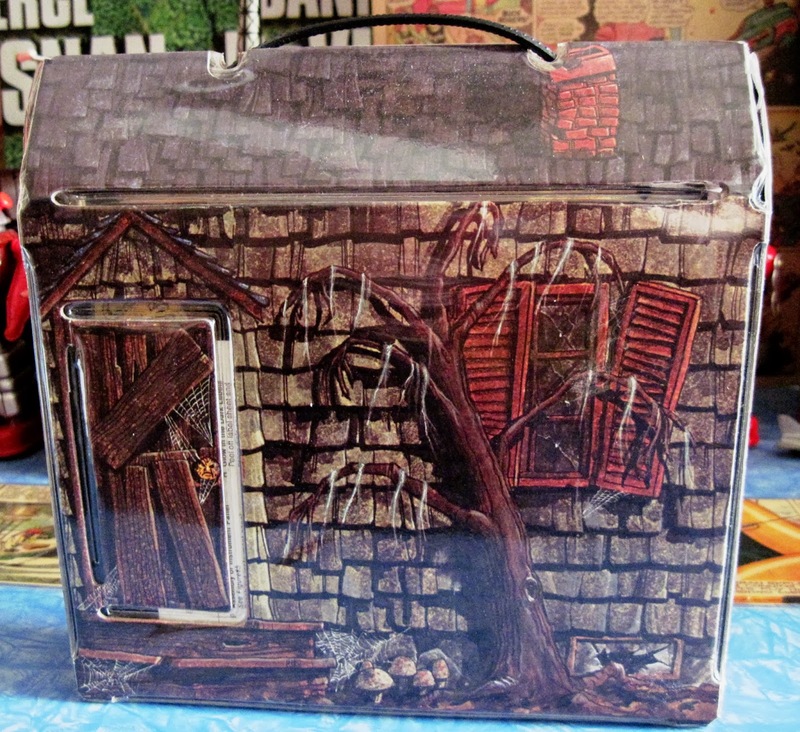 The front has a photo of the interior and describes the play features, while the back is illustrated to look like a haunted house. The action features described on the front are all made of heavy cardstock paper, and required some serious assembly work. 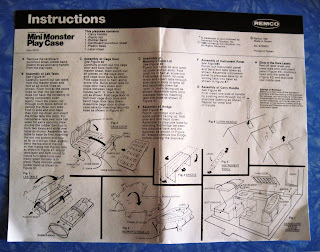 Check out the instruction page: I don't think I would have the patience to follow this now, let alone when I was 12. But once assembled, the monster playset was worth the effort. 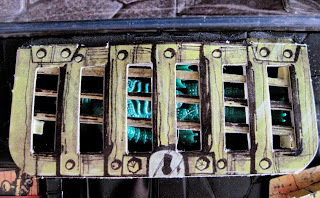 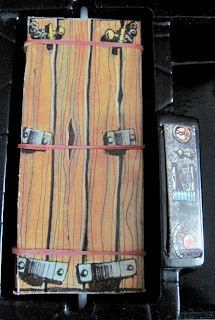 A little cardboard bridge helped monsters cross over a moat with a bottomless pit; a slab for Frankie came complete with rubberbands to hold him in place, and the table could be turned over to make him "disappear;" the mummy case opened; and the Creature from the Black Lagoon could be put into his cage covered holding tank whenever he needed a refreshing dip. 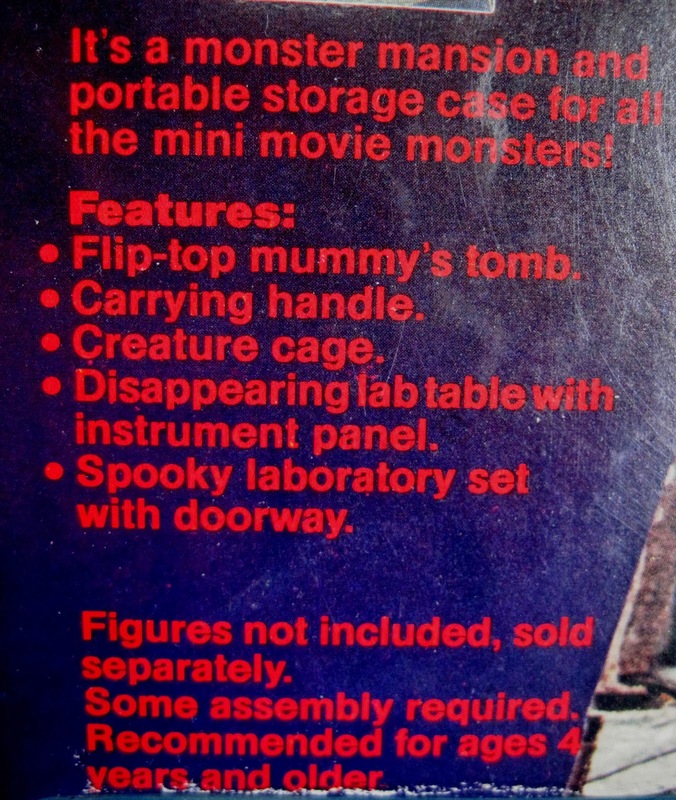 All three of these items, the Creature tank, mummy case, and slab, had to be punched out, folded, and assembled, as did the bridge over the "bottomless pit," below. 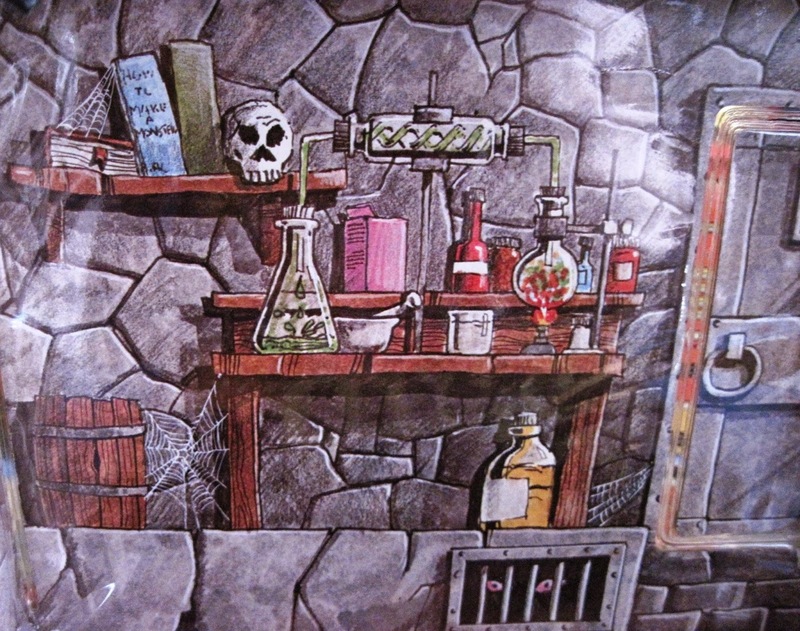 The set featured great illustrations, as in the lab background above. 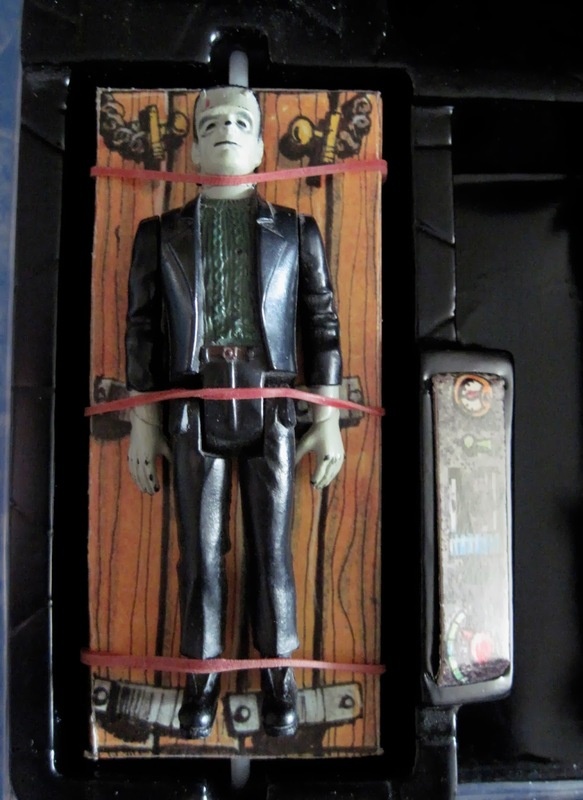 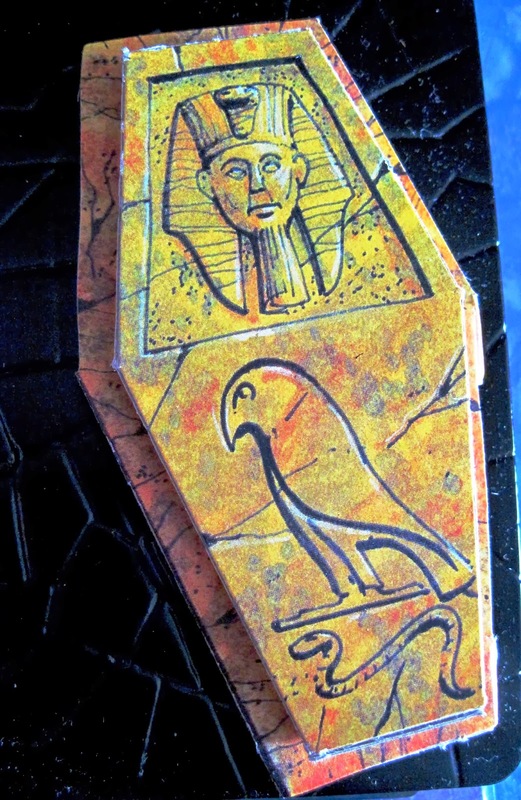 But the much touted glow in the dark features simply consisted of three stickers to place over various items on the playset: the mask on the mummy case, the skull on the lab shelf, and the instrument panel for Frankie's table. 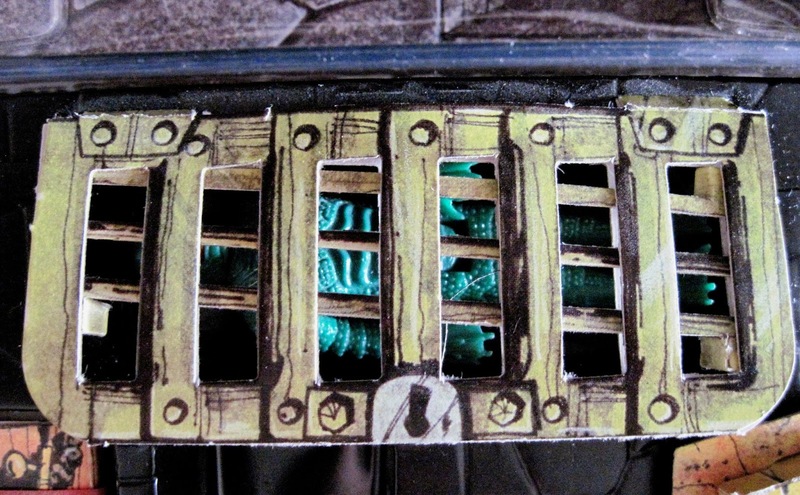 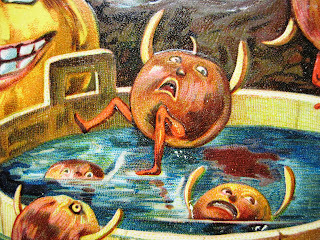 The monsters themselves are very detailed, especially for such small figures. The Wolfman in particular is well done, capturing Lon Chaney, Jr.'s anxious expression well. 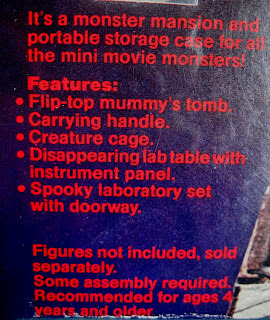 The set required careful closing and storage due to the fragility of the interior, and the detailed instructions included (unintentionally funny) directions on how to pack up the monsters: "Make sure that none of the monsters interfere with the closing of the playcase." 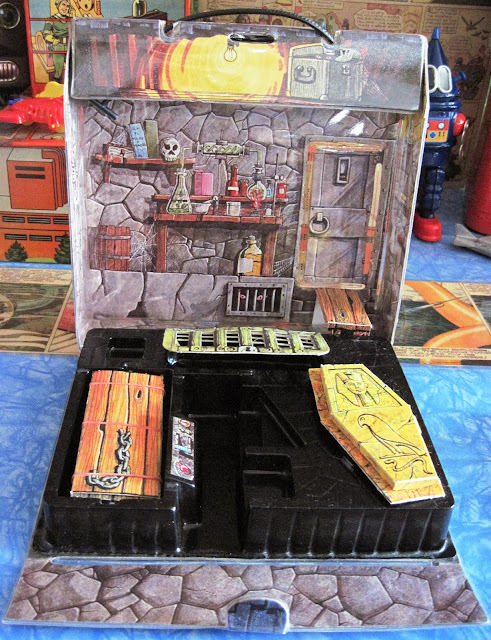 Every time I read this, I picture the little monsters shouting, "Nooooo," shaking their tiny fists, and desperately struggling to prevent the case from closing, maybe by sticking an arm or leg in the way. 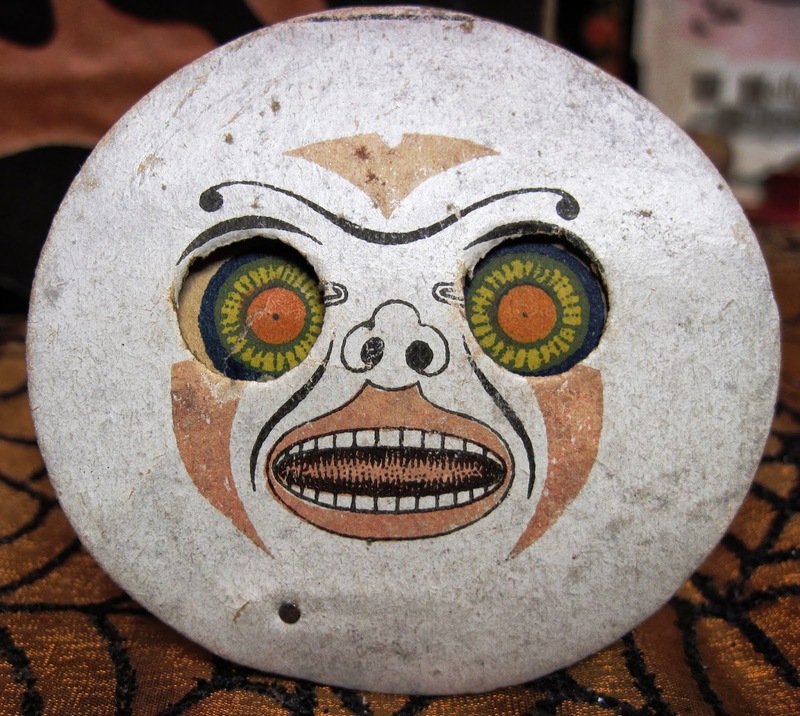 Intended to amuse toddlers back in the 1900s, these roly-poly toys are the stuff of nightmares today. 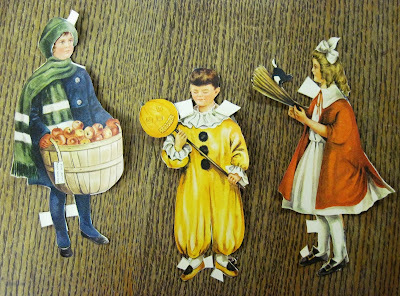 The Rolly Dollys were a line of simple toys made by the Schoenhut Company of Philadelphia. 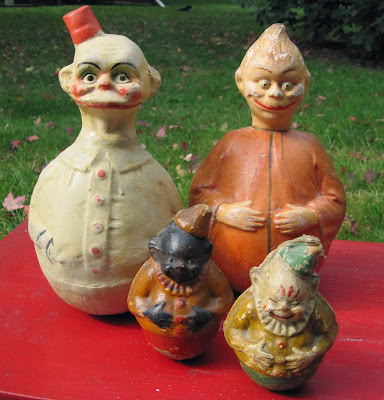 Founded in 1872 by Albert Schoenhut, a German born toymaker, the firm lasted into the 1930s and was a prominent creator of fine playthings and childrens musical instruments. 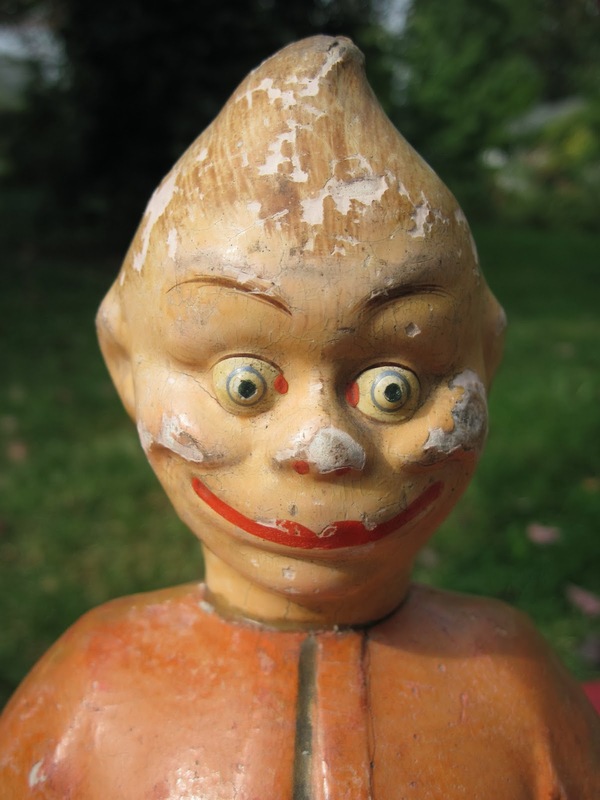 It is famed today for its toy pianos, Humpty Dumpty Circus playsets, and wooden dollhouse furniture. The Rolly Dollys first appeared in 1902 and were produced through the 1920s in over 70 different styles. Some were based on advertising or cartoon characters like Buster Brown and Foxy Grandpa, while others represented children, clowns, police officers, and more. This assortment includes a couple of creepy clowns, 5 inches tall, along with a 10 inch comic character, Happy Hooligan, and an unknown terror. 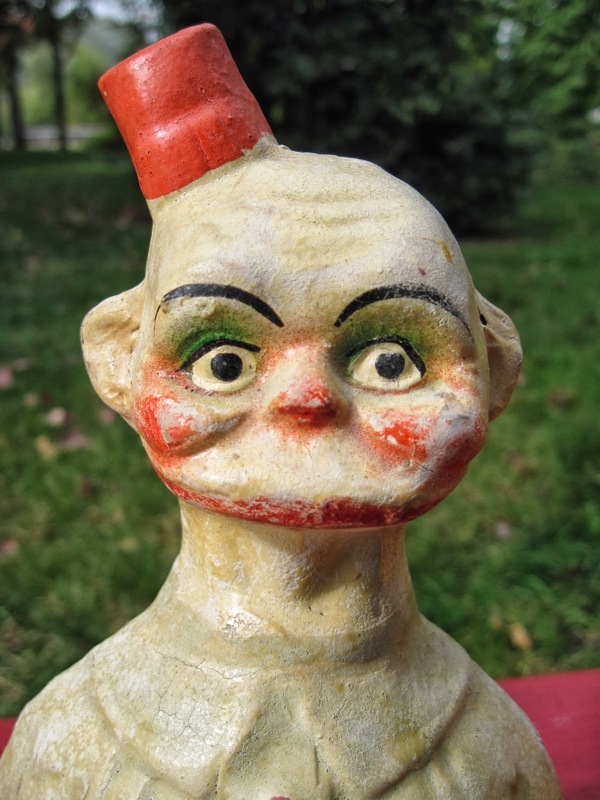 Here's Happy Hooligan, a newspaper cartoon character who first appeared in 1900. 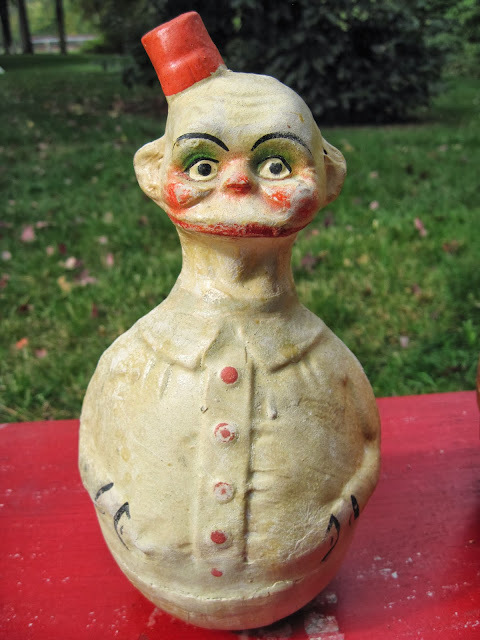 In print, he was a cheerful hobo wearing a tin can for a hat, but his Rolly Dolly representation is rather more disquieting. 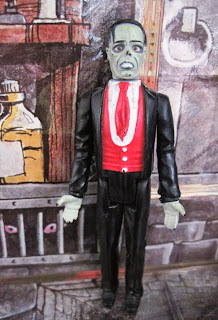 See the original Hooligan and learn his story by clicking here. 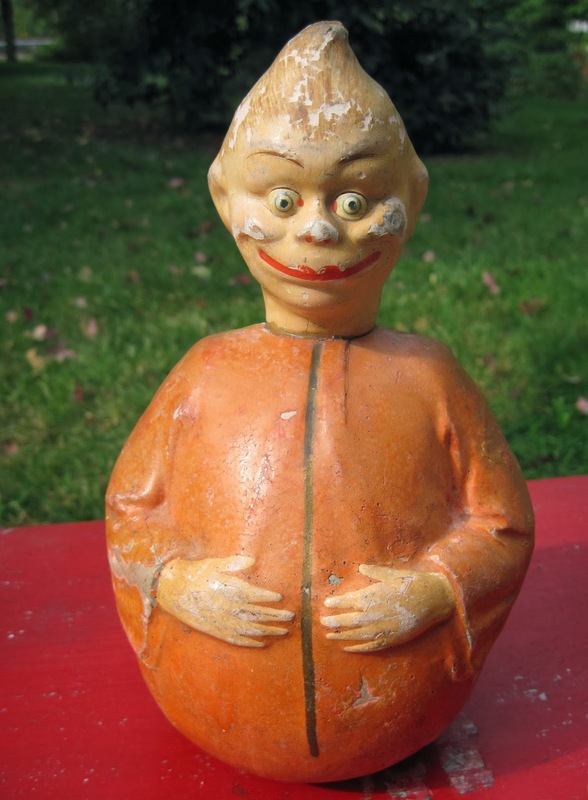 This unknown character, also 10 inches tall, sports a pointy hairdo and hypno-eyes, and his hands rest on his distended belly. He has a satisfied smile, as if he's just completed a large meal of small children. 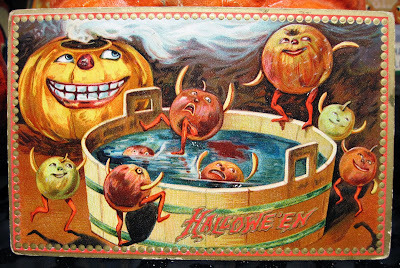 This is really not something you'd want watching you while you sleep. 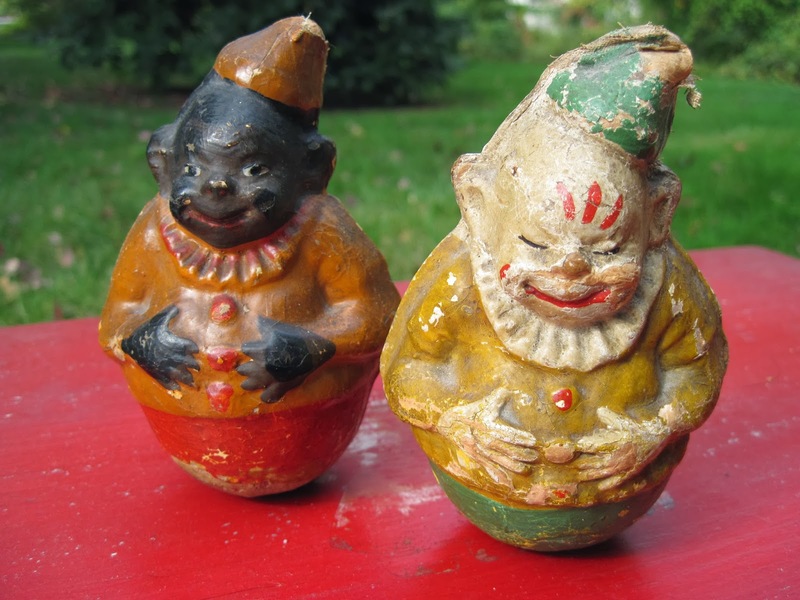 The 5 inch clowns are of the Billiken type. 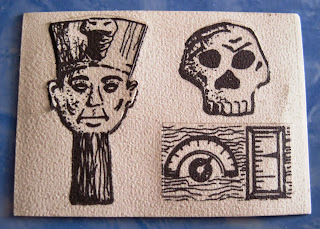 Even with their small size, there's still something vaguely menacing about them, isn't there? 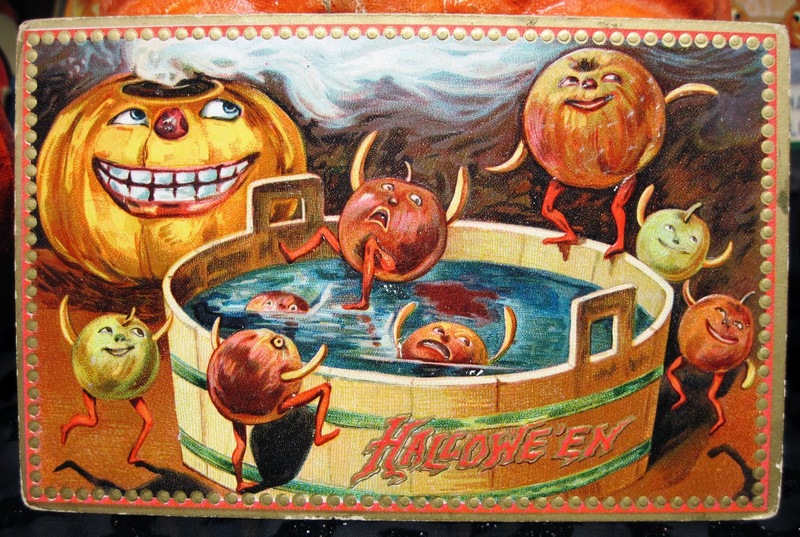 Perhaps they should team up with Crandall's Acrobats and put on a spooky sideshow act. Yay: it's October! Time for scary toys, creepy dolls, and antique Halloween. 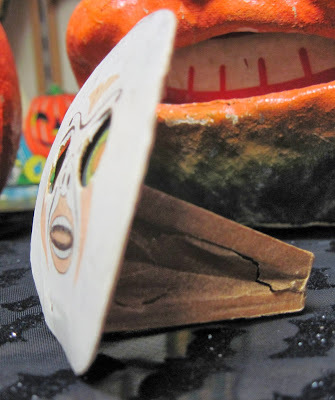 Spooky stuff coming soon!